At Grantleigh children are individuals and loved unconditionally. Through teaching of the highest calibre, Junior Prep pupils are encouraged to think for themselves, to use the skills they have acquired in various contexts to express their own enthusiasm and to rejoice in the differences that exist between them. This passion for bringing out the unique talents in each pupil lies at the heart of our education philosophy ensuring that pupils will want to go on learning all their lives. This is achieved through a caring and dedicated staff, well-adjusted pupils and a very supportive parent body. For effective learning to take place children must be actively engaged therefore they are exposed to co-operative, integrated and varied learning experiences. To ensure this, teachers keep up with modern and innovative teaching trends. We always endeavour to create an environment that is safe both physically and emotionally, where authentic relationships can develop between teachers and their pupils. Afrikaans mother-tongue classes were introduced from Grade R level at the beginning of 2015. To date we have Afrikaans classes up to and including Grade 3. 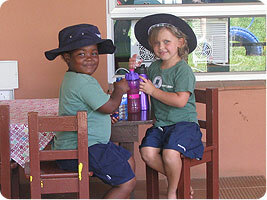 To support the academic programme, the children receive specialised teaching in certain subjects. They do this in groups of no more than 13 to optimize the learning experience. Grantleigh is following the “Why Not Computing” curriculum which provides all the components pupils require to master the computer. The computer is used as a tool for problem solving, creative expression and communication. It provides pupils with motivation and the means to improve their learning capabilities. In short, it supports other areas of learning and enables them to master their world. The benefits of music for young children in their cognitive, physical and emotional development seem to be limitless. At Grantleigh we use music to improve the pupil’s concentration, memory, co-ordination, fine motor skills, listening and communication skills, as well as their confidence. And then there is the most important reward of all – music is fun! The well stocked library provides a haven in which children can explore their new-found reading skills and they have a weekly opportunity to exchange books which they enjoy at home. The Junior Prep Art room is a place of creativity and fun. The children are exposed to a variety of different mediums and the wonderful young talent is showcased on a variety of places around the school. In conclusion, children at Grantleigh are encouraged to think independently and actively participate in the learning process and in this way they are led to independence and self-discovery.